Space Invaders is an exhibition now open at the NGA in Canberra. It is probably one of the most important exhibitions relating to street art that has been seen in Australia. 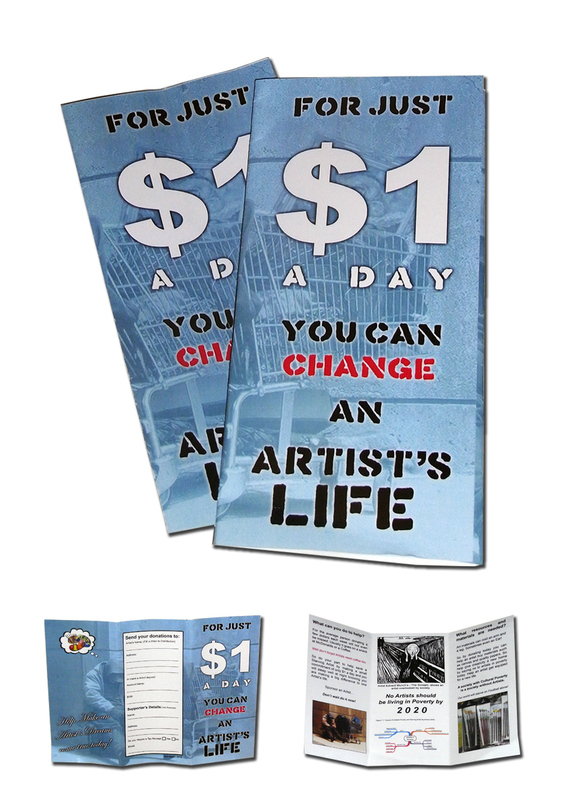 It gives the artform some real respect and places it into a serious art context. So if this is your thing and you can get up there it will be well worth the effort. 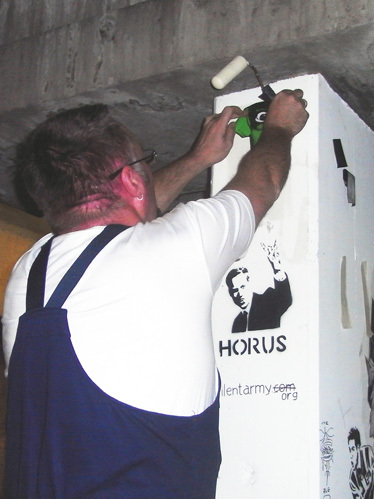 Below is a link to a story about the exhibition off the ABC…in it you can see one of my ‘Think Tank’ stickers on display up there. 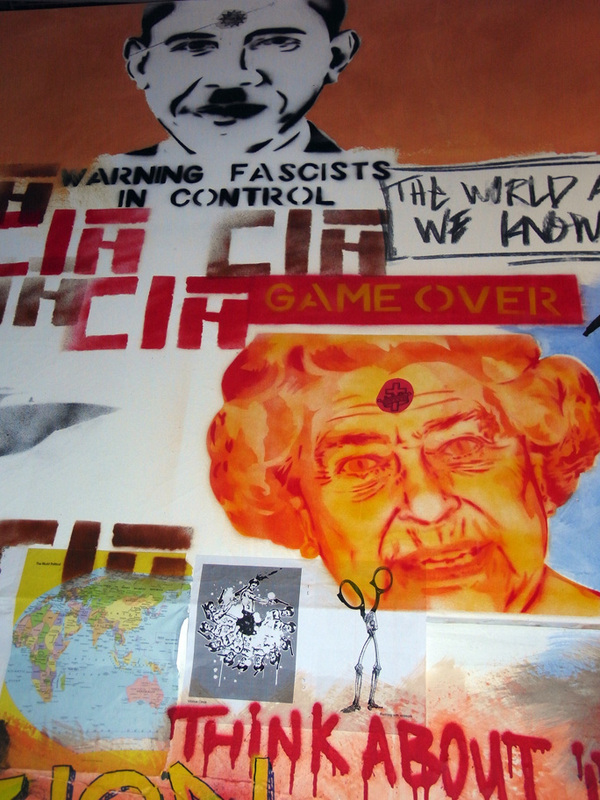 National Gallery showcases street art – ABC Canberra – Australian Broadcasting Corporation. 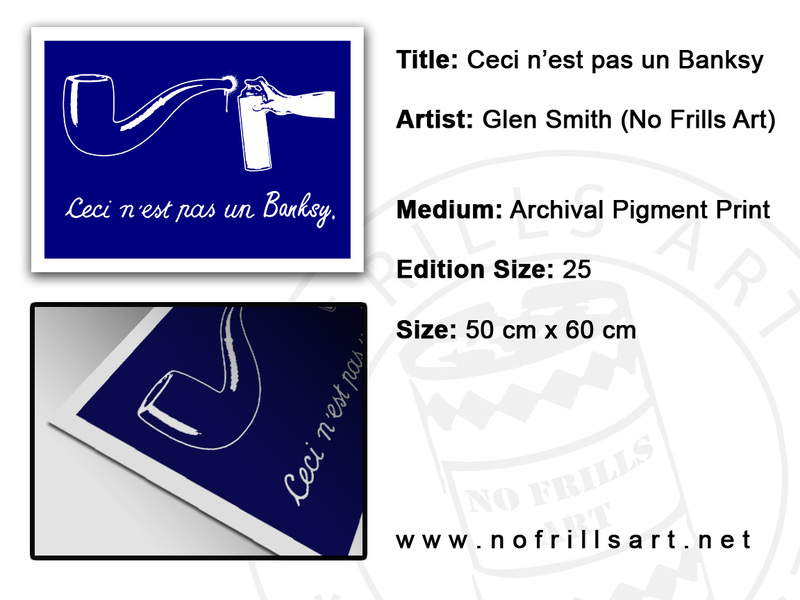 Here is my new print, “Ceci n’est pas un Banksy”. Sold a few of these over at the Sweet Streets festival. 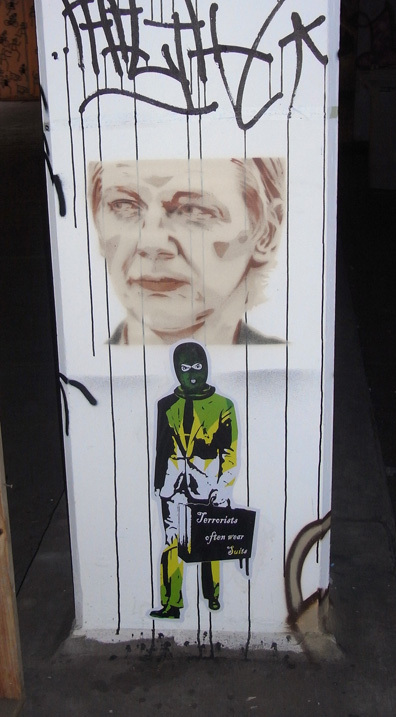 It’s just a bit of a piss take on how anything using a stencil is called a Banksy. What about Blek? …among others! Anyway, this was originally made just as a tongue in cheek image for a friend…originally titled, “The treachery of copyright images”. Looks sweet in the flesh…a solid and lush deep flat blue to it. Email me if you want one…going for about $70 AUD (plus postage). Well its been a few weeks since i have updated here. So it has been interesting times…I have been busy with work stuff but was also out of action for a bit with a torn calf muscle…yes painful, and it went pop…out loud! The Sweet Streets festival has finally come to a close. It proved to be sucessful for me with my painting in the award show selling, as well as four prints i had in the folio on the mech desk. 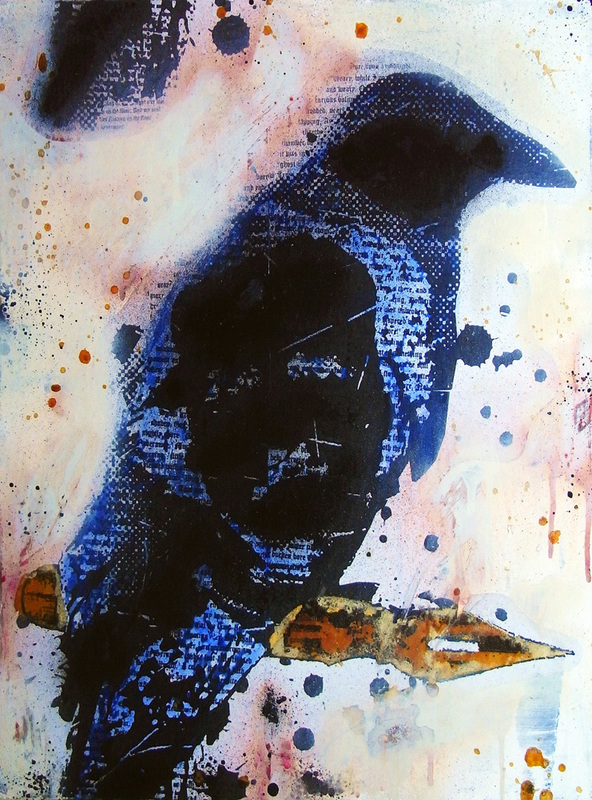 My piece created in the collingwood underground art park also found a home as part of the charity auction. There were a few serious bargins to be had at the auction, so if you missed it be sure to get along to next years one if you want to take home some seriously cool art at great prices, and help a charity in the process. Anyway, I will be updating a bit more over the coming week, but here are a few cool shots from the collingwood underground. I only had time to get some pasties together…but its all good! No Frills Mickey vs HaHa…pretty sure he’s going to get smashed! 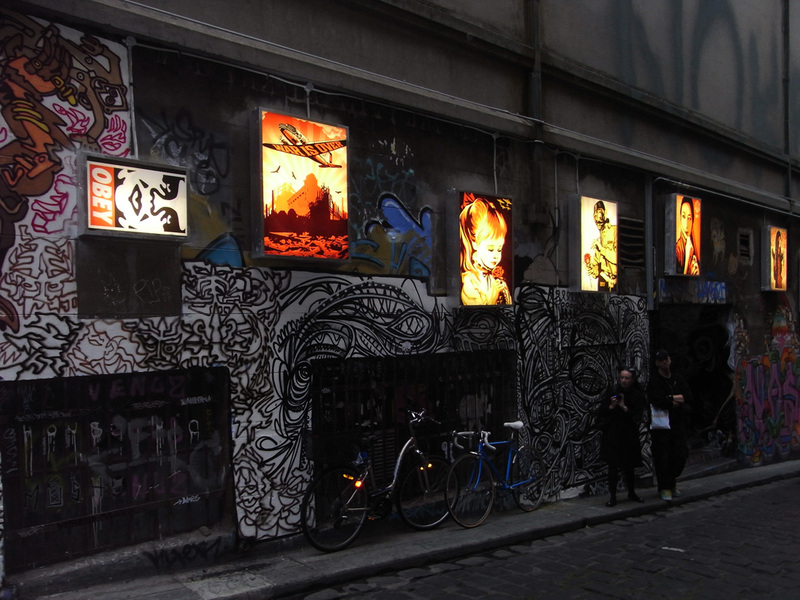 I only had little to do with this piece, but a bunch of my images made it into a cool installation over at a new space in North Melbourne called Urban Plot Projects. 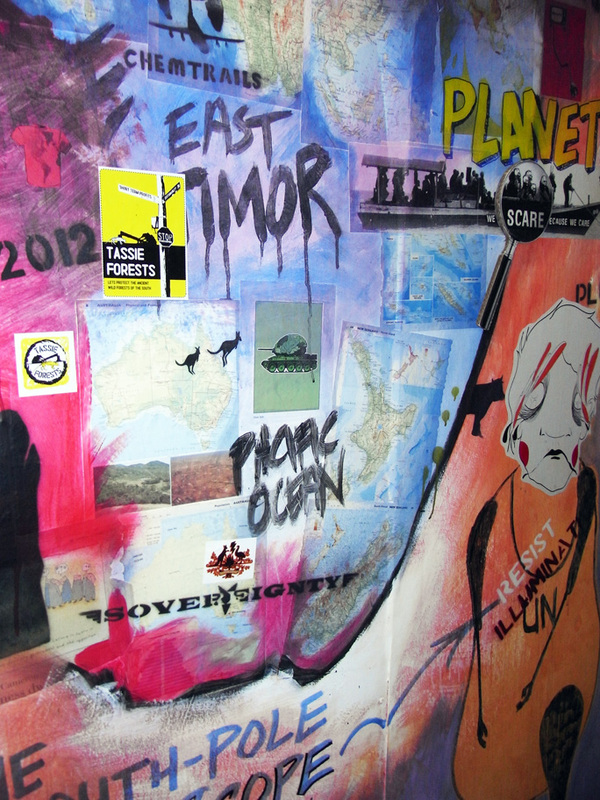 The large wall collage was part of an exhibition for the Melbourne Fringe festival titled Archeologies of the Future, and to officially open the space. 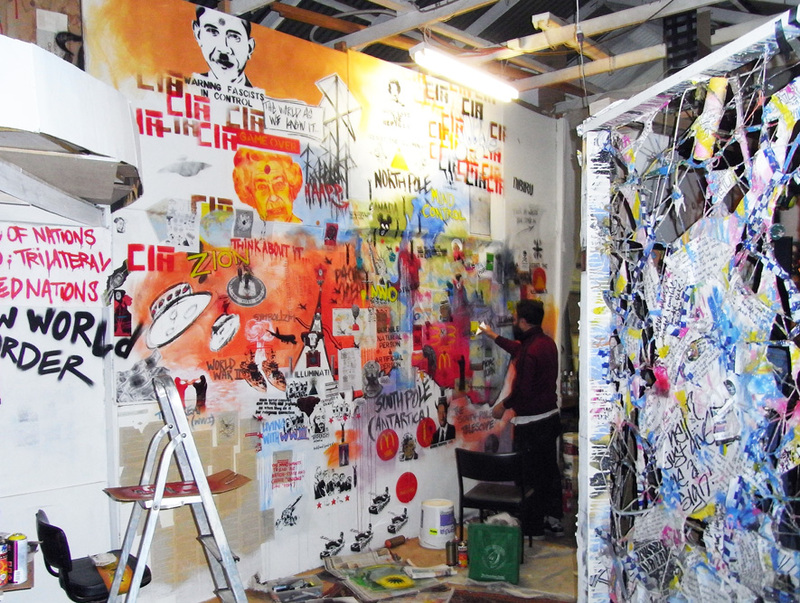 Others with work on the wall include Pheelix, Ha Ha, Phoenix the Street Artist, Breakdown Press…plus a bunch of others. If you get over there be sure also to check out the cool over sized paper cranes made from billposters by Ben Millar in the gallery section! And below a bit of an overview shot of the work, plus Ha Ha hard at work on it. Here is my first serious high quality digital print release. It’s a large archival pigment print on beautiful heavy weight Canson Paper. I have three other prints also about to be released over the next week so stay tuned. These will all be available on the Mechandise Desk at Sweet Streets HQ. So from the Sweet Streets Award Show (8/10/2010) and over the sixteen days of the festival these will be available from 1000 Pound Bend in Melbourne for $90. 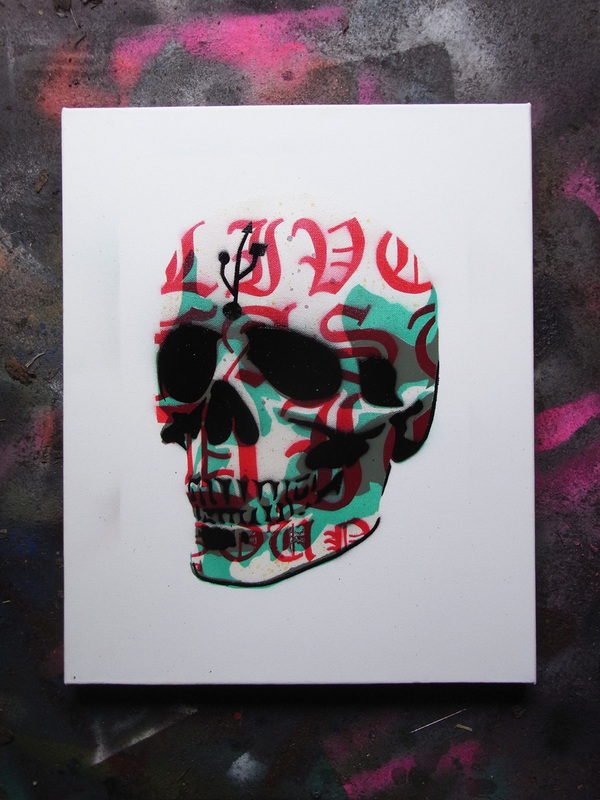 These are signed and numbered and in a small edition of only 25! 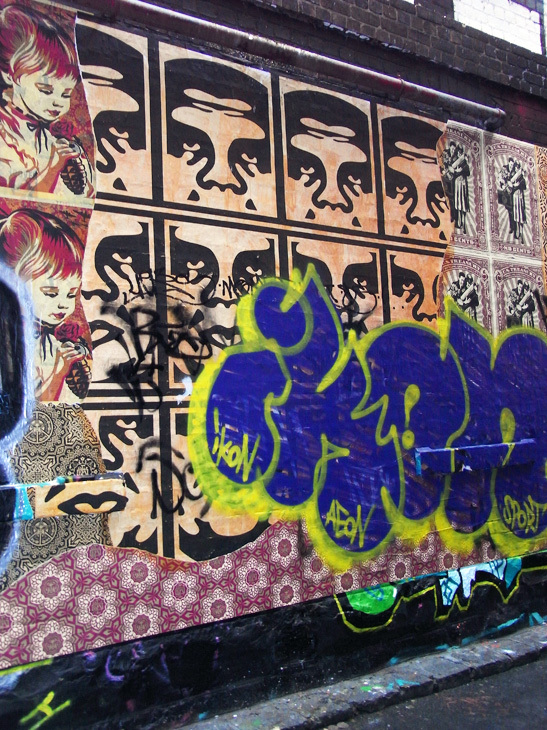 If you haven’t heard about Sweet Streets, its melbourne’s premier Street Art festival…formerly Melbourne Stencil Festival. 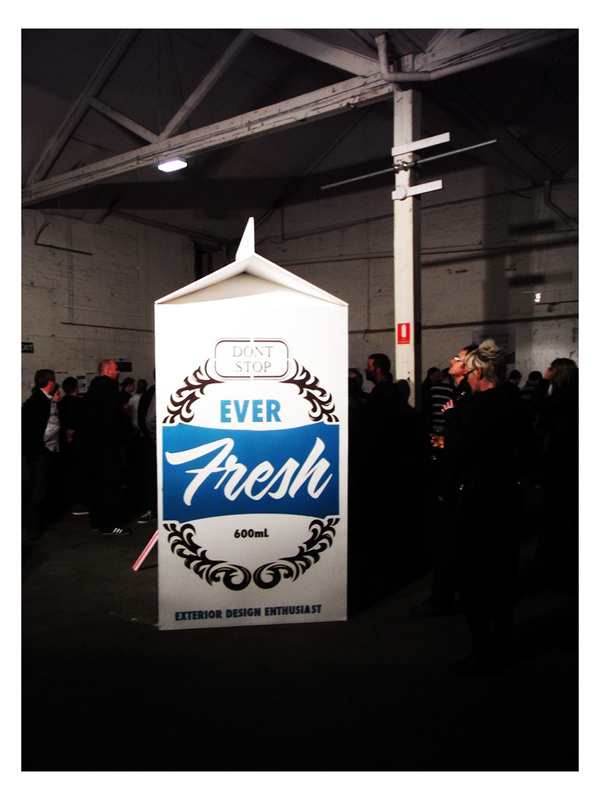 Anyway, if your around old melbourne town between Oct 8 – 24 there will be a bunch of stuff on. I have a work in the Award Show over at 1000 Pound Bend opening on 8th Oct – 6pm. So if your about and looking for something to do get on down to the show! I have been busy, busy…busy over the last week or so. I have not had much time for making art due to my day job being at its busiest peak and having a big design project on taking up most nights till late. I will reveal further details on this a bit closer to time as it is a cool gig. 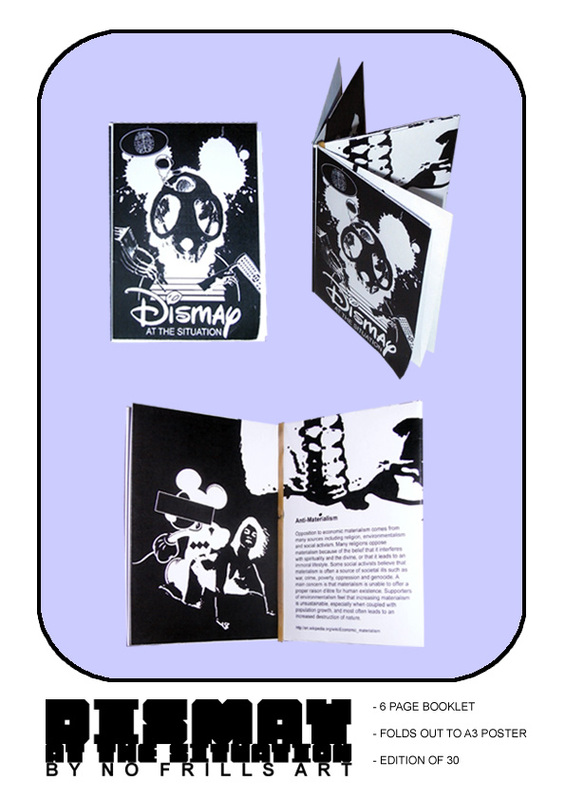 I have however made a new zine called Dismay as part of the research i was doing into making a book/poster for the design project i just mentioned…so that was fun. Also my other zine End Game is now in stock and available at Sticky Institute! I did manage to find the time to make it to the Everfresh launch and collect my copy of their new book. 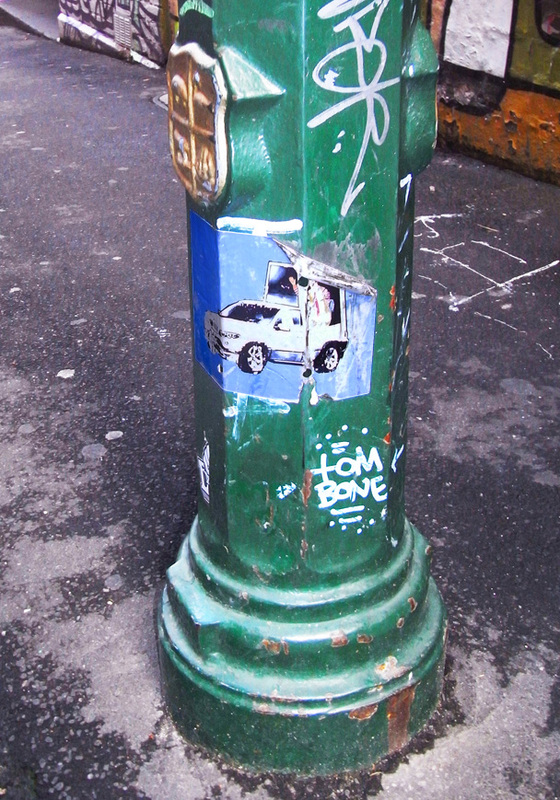 It’s very cool so if Melbourne street art is your thing, do yourself a favour and head on over to their site and check it out. 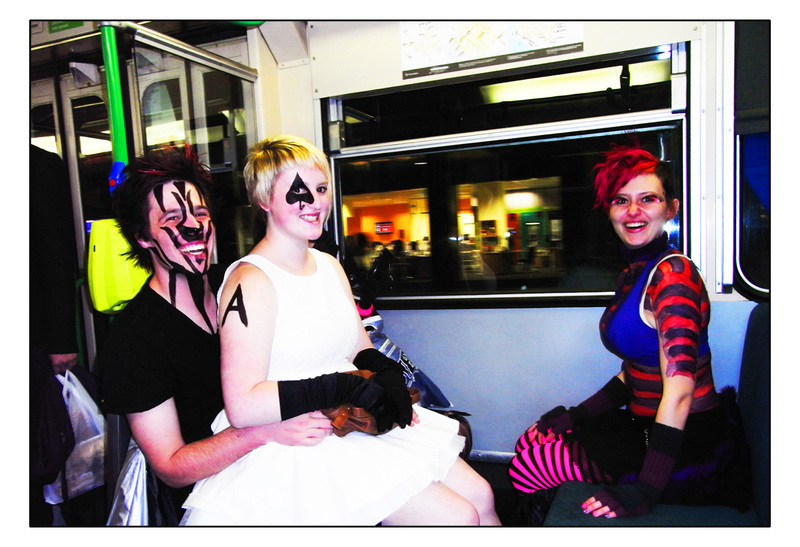 And finally just for fun, here is a pic of some crazy kids i came across on the tram the other night. 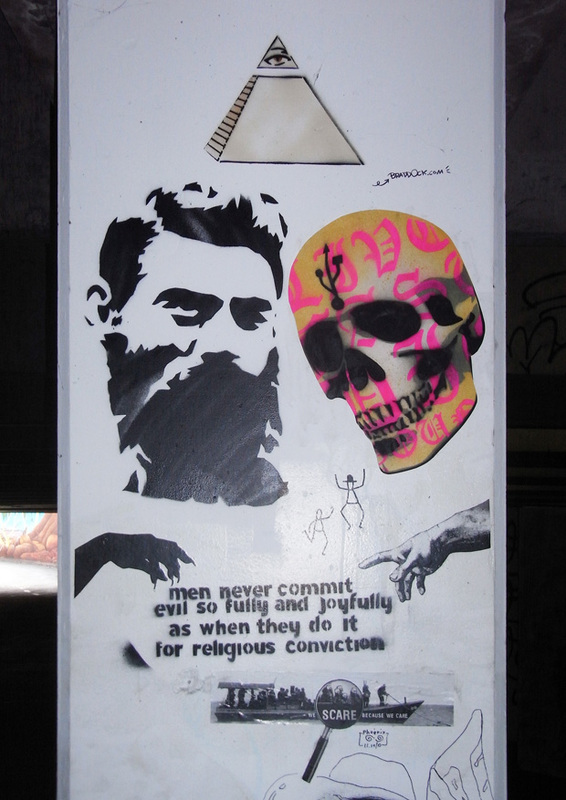 Here are a few images of some of the awesome new stencils by Melbourne based street artists HaHa. 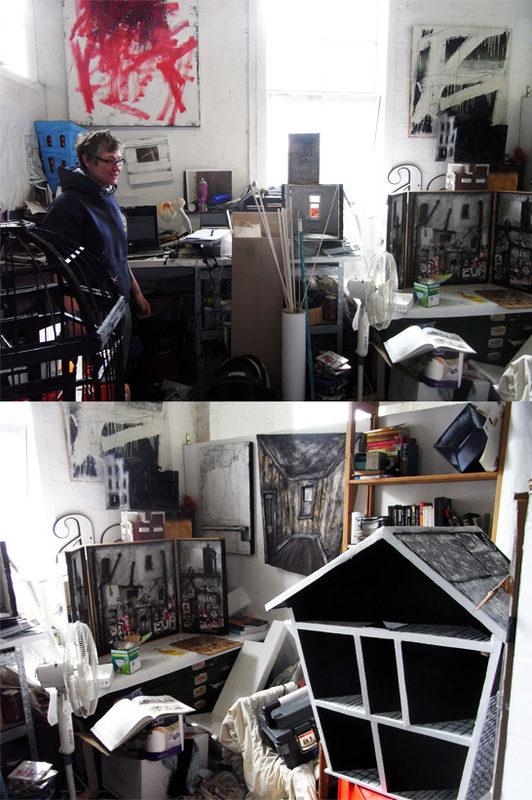 I have sat on these pics for a few weeks to avoid being a spoiler…as they were taken in his studio and were for an exhibition in Brisbane. Its now opened, so i thought i would throw them up here now. They are pretty impressive being about 2.5 metres high and using up to 40 layers. 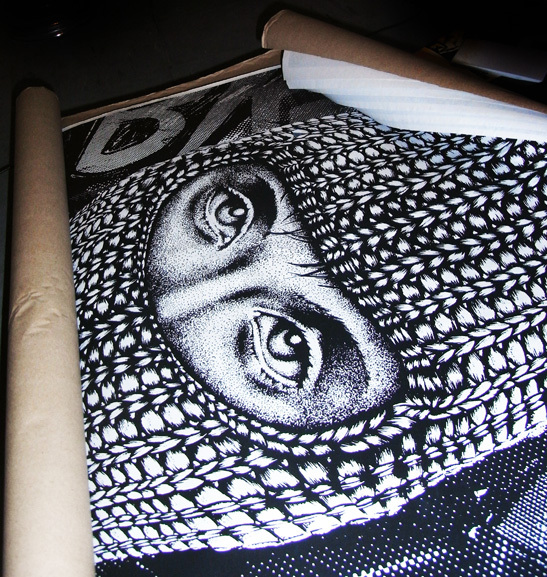 So keep your eyes peeled for his work, its well worth it! 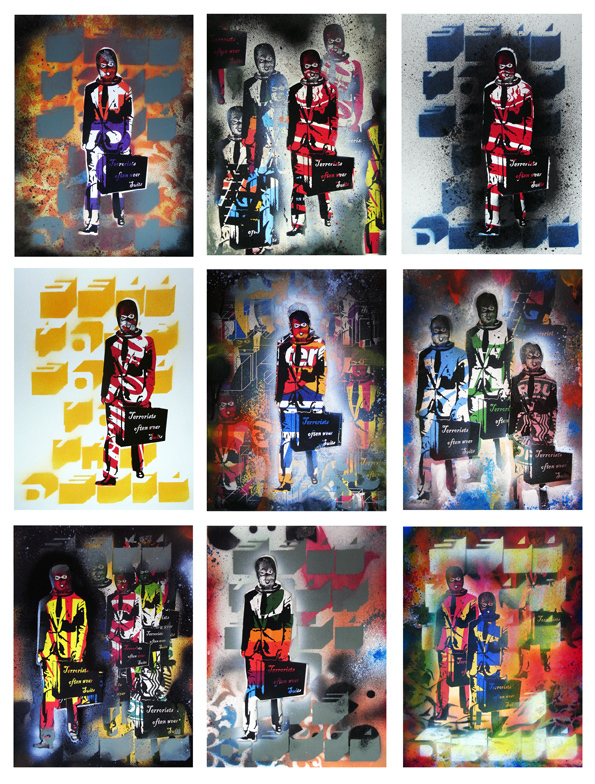 Here are my new paintings based on my ‘Terrorists often wear suits’ image that just recently went up in Rutledge/Hosier Lane. 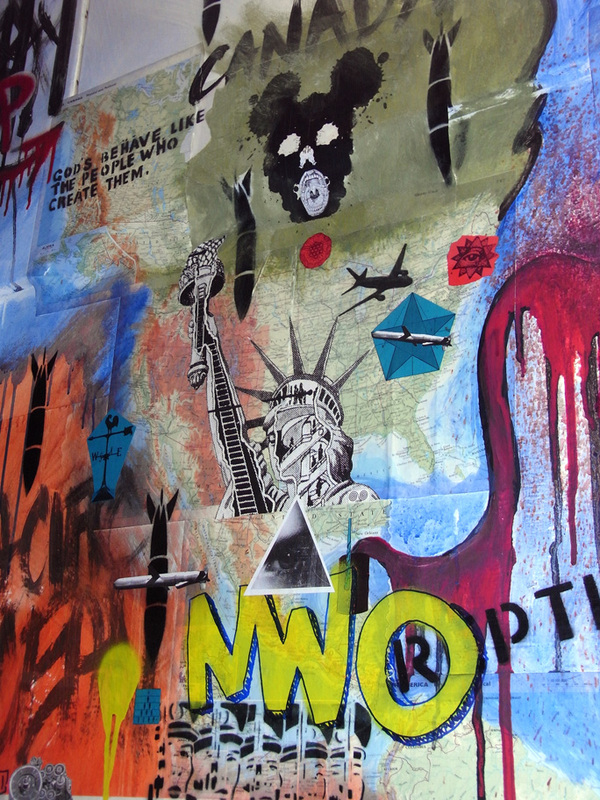 The terrorists wear a range of abstracted multinational logos on their suits. These are a bit experimental, being digital prints on a heavy weight canson watercolour paper with spray paint…and the odd bit of ink over top. Then a matt varnish top coat. I’m having a bit of fun with them…fun enough to drag me out to the workshop in this cold weather. Enjoy! 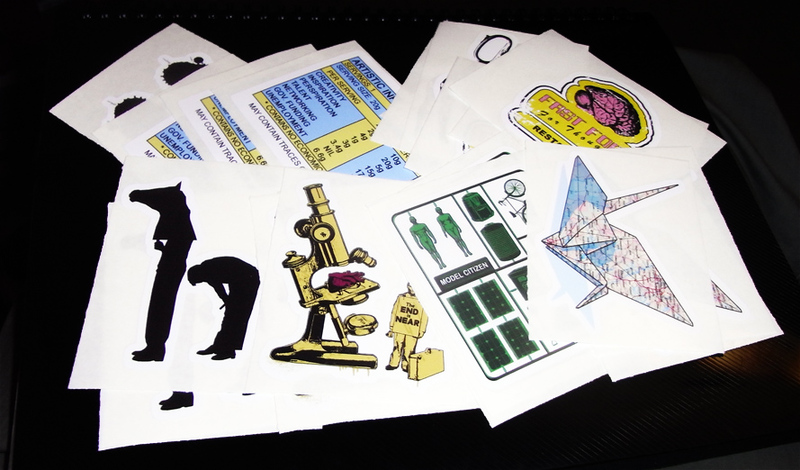 Here are my new die cut to shape stickers that just arrived. Very happy with the results…they look sweet. 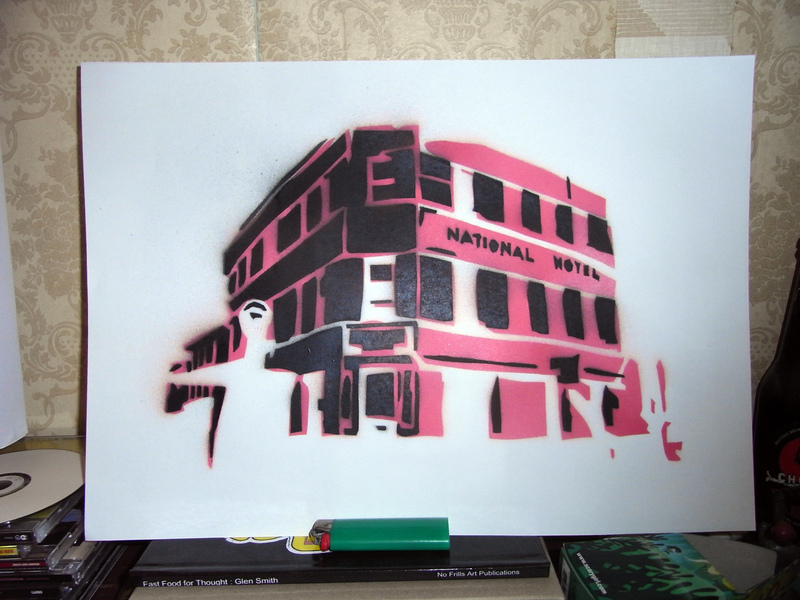 and finally a little stencil of my local just for fun. Enjoy! New Stencil work I did this week. Five layers of hand cut goodness! 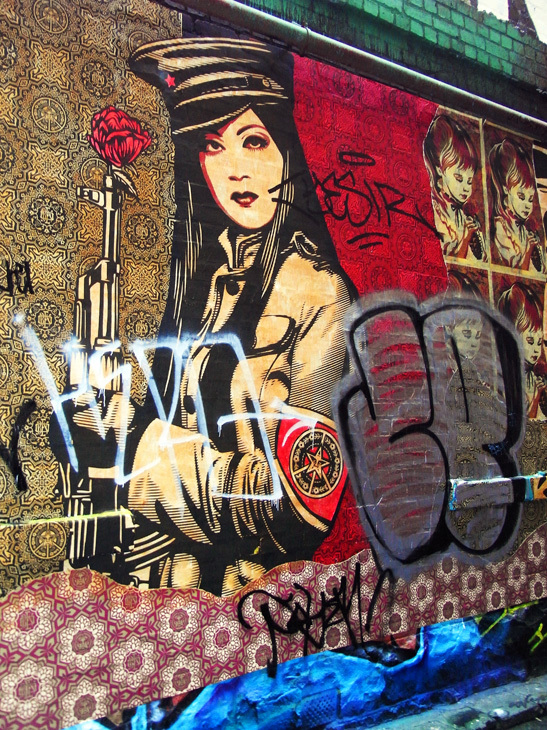 If you go for a wander down Hosier Lane in Melbourne at the moment you may stumble on the new Obey piece to go with the exhibition of his prints upstairs at Until Never Gallery. Methinks it looks pretty sweet. Get there before it gets burried in tags. There were a few pieces in the Citylights lightboxes also. I also stumbled across one of my old stickers. 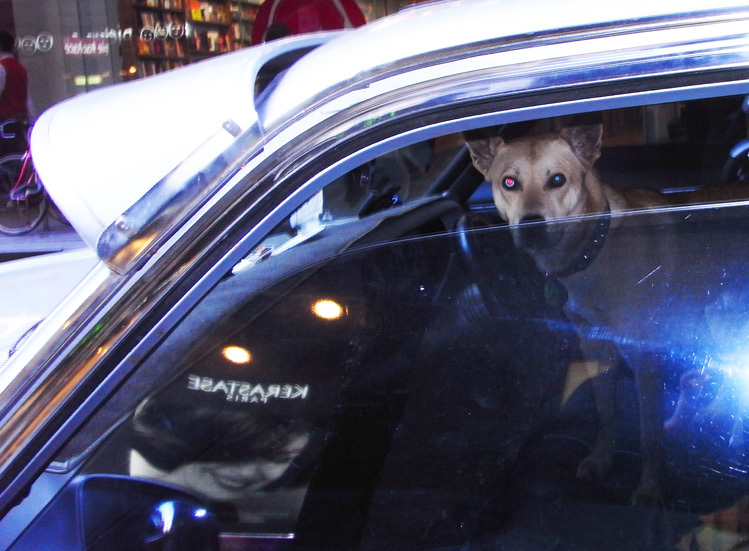 And this cool David Bowie dog sitting in a classic old car. 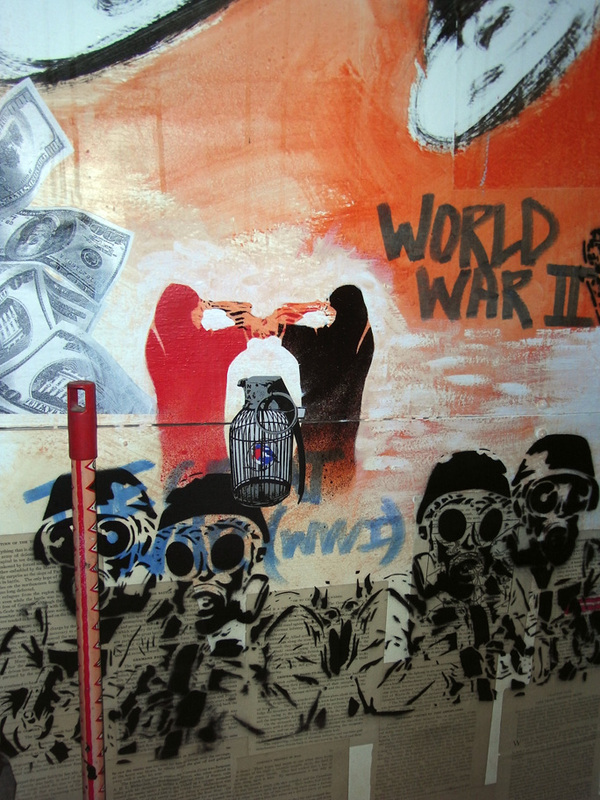 Here are a couple of simple little stencils on canvas that i hope to drop off in the laneways of melbourne tomorrow. Hopefully, they get to adorne an alley for some time…before some cunning punter decides to give them a new home. So keep your eyes peeled! 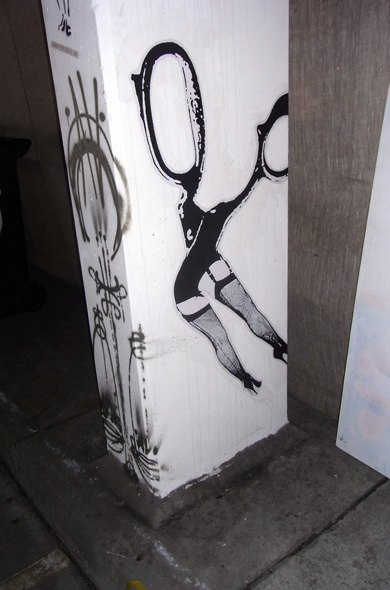 Homage to Bettie Page, Spraypaint on Canvas, 20x27cms – 2010. 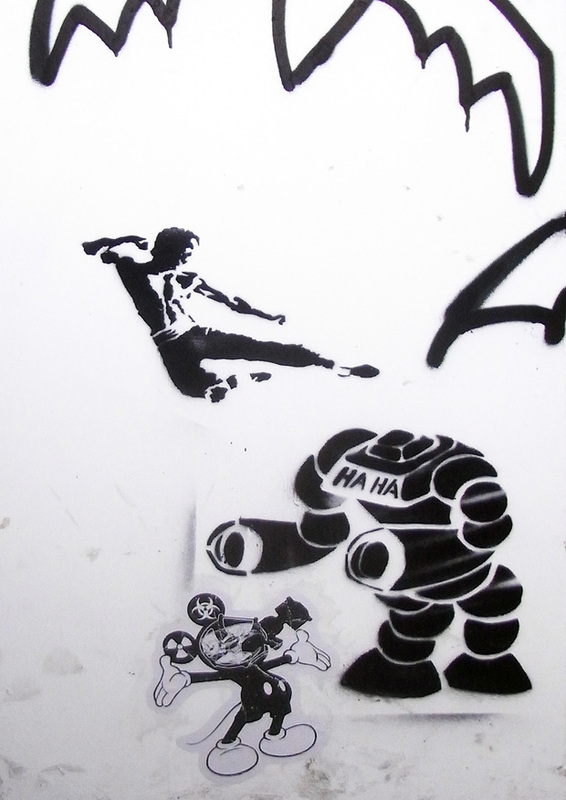 Horseplay, Spraypaint on Canvas, 22x30cms – 2010.